How to determine the date of production/manufacture or age of CleaverBrooks® HVAC Systems. The date of production/manufacture or age of CleaverBrooks® HVAC equipment can be determined from the PSI Date which is located on the data plate. Description: On the electrical panel or front head of every boiler or burner sold by Cleaver-Brooks is an identifying nameplate. Operational data about that particular unit can be found on the nameplate. Inspectors frequently reference this information to ensure the equipment is operating within the parameters set by the original manufacturer. The nameplate also provides essential information for ordering replacement parts. Sometimes, the specific pressure rating is required for a part, or the serial number is needed. If the parts department is unable to locate a particular job file, the nameplate data can reveal the original setup information. Fuel series information and boiler model type also help to guide the Cleaver-Brooks staff. 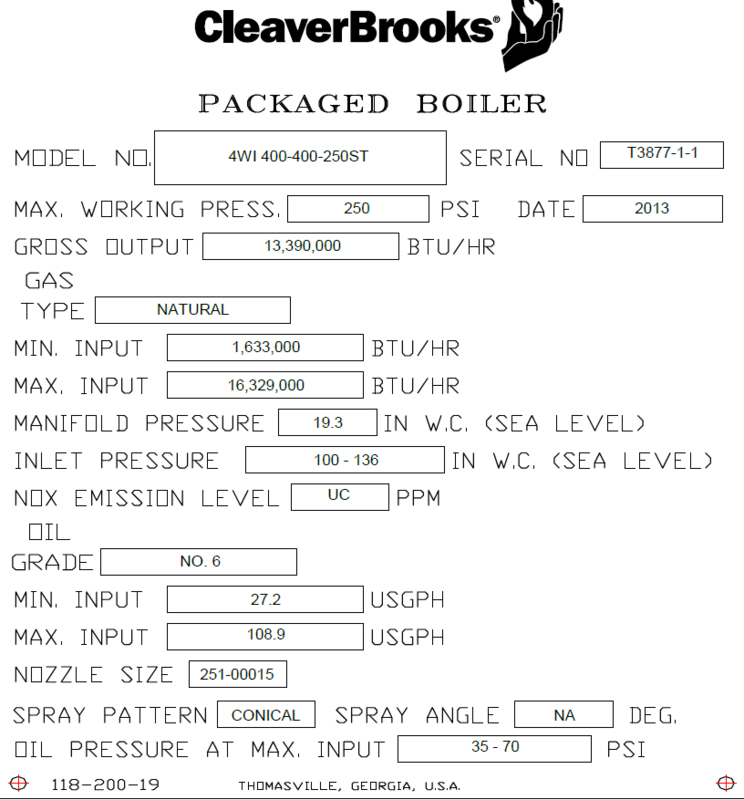 If the birthdate of a Cleaver-Brooks boiler is 1996 or later, there is a bill of materials in the Cleaver-Brooks Navigator research tool. Using this resource, an authorized company representative can access the spare parts list and obtain a list of tune-up spares as well as a list of annual inspection spares. Below is a sample firetube nameplate along with information about each field. Many of the fields are straightforward; however, some usually require an explanation. Model No: The first number (4WI) is the boiler model number. The second number (400) is the fuel type. The third number (400) is the size. In this case, the unit of measurement is horsepower. The fourth number (250) is the design pressure in pounds. The initials at the end represent either steam (ST) or hot water (HW). Maximum Working Pressure: For this particular boiler, the working pressure is 250 (measured in PSI). Gross Output: Maximum boiler capacity output is 13,390,000 BTU/hr. Gas Type: Listed as natural or propane, landfill/digester or methane. Minimum Input: Input is based on fuel type, which is 1,633,000 BTU/hr for this boiler. Maximum Input: Input is based on fuel type, which is 16,329,000 BTU/hr in this case. Manifold Pressure: Minimum required gas pressure at the burner. Inlet Pressure: Required to regulate gas pressure at the inlet to the gas train. NOx Emission Level: UC stands for uncontrolled emissions. If 9, 15, 30 or 60 were in this box, the NOx emission level would be that number or less. Oil Grade: Fuel oil type options are No. 2 (light oil), No. 4 (kerosene) or No. 6 (heavy oil). Minimum Input: Input is based on fuel type, which is 27.2 USGPH in this case. Nozzle Size: Part number to the oil gun nozzle. Spray Pattern: Oil gun nozzle pattern, which is conical in this case. Spray Angle: Measured in degrees. Oil Pressure at Maximum Input: Measured in PSI. Serial Number: The Cleaver-Brooks unit ID. Each unit has a unique number. PSI Date: Year the boiler was built, which is 2013 for this boiler. The nameplate design has changed over time, but the information included has remained the same. If the numbers or words are hard to read on a nameplate, the best way to retrieve the information is via a paper/pencil rubbing. Cleaver-Brooks can then re-stamp and send a new plate.